Quitting Xanax is hard. This article reviews how friends and family can help someone battling Xanax addiction. ARTICLE OVERVIEW: Is someone you know addicted to Xanax (alprazolam)? If so, you’re not alone. Xanax is known to cause dependence. Once the body has adapted to Xanax, it’s hard to quit. We review how friends and family can help here. Most people don’t start using psychoactive drugs like Xanax thinking that they’ll get addicted. Many people are actually prescribed Xanax by a doctor. Instead, addiction is usually a combination of time, physical changes, and intent. What is addiction, really? An addiction occurs when drug use is no longer fun. Addiction is present when you’re using Xanax just to get through the day. You see, over time our bodies adapt to a drug to the point of needing it to feel normal. Without the drug, the body will begin to go through withdrawal. So, when does this transition happen? How does the body go from getting high to needing a drug? The answer is different for every person. Some people start with a prescription. Others mix Xanax with other drugs. The main sign that you’ve got a Xanax problem is that you can no longer control your need to take it….even if you’ve had negative consequences to home, health, or work life. You need Xanax as a crutch. It’s now that you should reach out for help. When someone uses Xanax daily over a period of time (ranging from 3-6 weeks), the brain changes how it operates. Xanax – main ingredient alprazolam – works by attaching itself to GABA receptors in the brain. When alprazolam hits the central nervous system, it relays messages throughout the body to the brain. In turn, this calms the nerve activity within the user. This is why Xanax is prescribed for mental disorders such as anxiety. However, doctors should issue scripts for a short period of time – usually no longer than a month. When Xanax is taken too much, too often, or for a longer period of time your body adapts. The brain produces stimulant effects to counter the depressant effects of the alprazolam. So, when you start coming off the drug, you’ll experience the “stimulant effects” known as withdrawal symptoms. Withdrawal is the body’s way of returning to a state known as homeostasis. Xanax can be a tricky drug to spot, as not everyone who takes it becomes addicted. Rather, there are some people first become physically dependent on Xanax. Then, they become psychologically dependent on it. Drug dependence is when the brain and body have physically adapted to the chemistry of Xanax. This is a survival mechanism. When the brain becomes accustomed to the effects of the chemical properties of Xanax, it does so in order to continue to function. People who are dependent on Xanax might be able to manage responsibilities and even hide their drug use. But when they quit, they’ll go through withdrawal. Drug addiction is when Xanax use becomes compulsive to the point of bringing harmful consequences. People struggling with a Xanax addiction have the inability to stop despite it resulting in negative effectives on their responsibility. Plus, a person who’s addicted may go through withdrawal, but will eventually return to taking Xanax as a way of coping. With this in mind, you might ask yourself, how can I tell the difference between dependence and addiction? Have you ever tried to quit Xanax without success? Do you find yourself craving to use Xanax? Do you mix Xanax with alcohol or other drugs? Are your responsibilities (i.e. school, work, family) at risk due to your Xanax use? Have you continued to use Xanax despite it causing problems in your relationships? Do you find yourself in risky behavior due to the fact that you use Xanax? Do you spend a large amount of time thinking about, obtaining, and/or using Xanax? If your loved one answers yes to one or more of the above questions, there’s a good chance they’re facing a Xanax addiction rather than a dependence. However, in order to be sure, you’ll want to consult a doctor to set up an assessment. Or, you can call our confidential hotline to talk through the process with a trained recovery specialist. Still, when trying to figure out if a loved one is facing an addiction or not, it comes to no surprise you’ll run into difficulty. It can be hard to tell the signs and symptoms of addiction as they aren’t always visible or obvious. Furthermore, people struggling with addiction aren’t always open to talk about it. Many will fight back with denial. 2. Their anxiety coming back strong. Due to these factors, Xanax can be highly addictive. Though the body has physically adapted in a way that can be difficult to stop, it’s the psychological effects – the cycle of Xanax addiction – which can make conditions worse. If a loved one is going through denial, you need to seek professional guidance for yourself. Preferably, with a licensed clinical psychologist or counselor who has experience with addiction. The importance of this is, admittedly, you don’t entirely know how addiction is affecting your loved one. Therefore, you’re not entirely sure how to help. Bring up conversation about recovery at the right time. Stay safe around a person struggling with addiction. Men and women who are deep into Xanax addiction are likely to continue using unless they’ve reached a point of despair through an incident or accident. As someone who cares, it’s in your best interest to do all you can as a means of avoiding this. The most efficient way to get the right message across to your loved one is through an intervention. If you need some help, you can seek out a professional interventionist. You can also call us and schedule a time to meet with a network-wide interventionist. Or, you can speak with a family counselor or addictions therapist to ask for a referral. 1. Carefully Choose Who Will Attend: Though this isn’t the case with everyone, many of those addicted to Xanax have high rates of anxiety. Therefore, you’ll want to be keen on who’s present and whether or not they have the right dynamic for this intervention. 2. Get Some Advice Before You Begin: As we’ve discussed, it’s important to seek out an addiction counselor or professional who has experience in conducting interventions for addiction. They’ll inform you of important points to cover as well as how to handle the emotional side of your loved one’s addiction. 3. Plan Communication in Advance: People who struggle with a Xanax addiction can be vulnerable due to their high rates of anxiety. You’ll want to know what you’re going to say and how you’re going to say it as a means of reaching their comfort level. Avoid exaggerations and always emphasize on your love and support. 4. Prepare for Anything: There’s no telling how someone struggling with addiction will react to an intervention. So, be sure that the intervention is invitational in nature. In other words: No surprises! Especially for someone who has anxiety and uses Xanax as a means of avoiding it. Some individuals will understand while others will retaliate. It’s best to prepare for anything. This is where a professional comes in handy. 5. Suggest Consequences: Make sure your loved one understands specific consequences will apply if they don’t seek treatment. These can include financial withdrawal, putting their employment at risk, or removing access to shared living arrangements or visitation rights. 6. Provide a Solution: Your goal is for the intervention to go well and for your loved one to take the first steps towards sobriety. Therefore, you’ll want to provide them with the opportunity to get better. This can be the offer of a treatment facility or other options towards sober living. 7. Follow Through: The intervention is only the first step towards recovery. Make sure you follow through with your loved one and help them discover the right treatment facility. Additionally, schedule regular family therapy to help heal dysfunction within the system. During detox, the body rids itself of Xanax and returns back into its natural state. People begin to experience Xanax withdrawal around 6 to 8 hours after their last dose, with symptoms peaking around 72 hours later and ceasing within a week. In fact, Xanax withdrawal can be highly uncomfortable. Therefore, medical support can make a huge difference during this process. Always seek medical advice and tapering protocols anytime you plan on coming off Xanax after a period of dependence. Furthermore, make sure your loved one stays consistently hydrated. Due to symptoms like vomiting and diarrhea, there’s a chance for dehydration, which can be dangerous. Treatment will prove to be a vital time for friend and family support. Mental health and Xanax addiction go hand-in-hand. Most of the time, people experiencing an addiction are avoiding their mental health. Therefore, it’s important for you to understand your loved one will need much aid in this regard. Most likely, addiction treatment will include a variety psychotherapies. The purpose of talk therapy is to people adjust to day-to-day functioning without the perceived need for Xanax. This is done practically: rehab helps us learn how to handle emotions and behaviors. Simultaneously, we learn techniques to help reduce cravings or learn how to move through them. Psychotherapies generally last anywhere from 3 to 6 months for Xanax addiction and sometimes upwards, depending on the level of addiction and severity of other issues. There are a variety of things you can do in order to ensure your loved one gets the best out of treatment. Be present at family therapy sessions. The bottom line is this: What you need to do first is seek medical help. It’s hard to achieve long-term sobriety and avoid Xanax relapse without the professional help of a reputable treatment program. When discussing the cycle of addiction, it’s common to crave the drug due to the memory of how good it feels. For this reason, clinicians and scientists have developed a variety of effective treatments which aim to help those struggling how to re-learn how to live life without taking drugs. Call us to learn more about treatment options. Think you’re alone facing a Xanax problem? The rate of those being admitted into treatment facilities for Xanax has skyrocketed. In 2003, a little under 8,000 people were admitted to rehab for a problem related to Xanax. In 2012, just under 60,000 people were admitted. In that same year, it’s estimated 23,639 of those individuals were abusing Xanax for nonmedical purposes. Prescriptions for Xanax have, likewise, skyrocketed. In 2006, a little more than 37,000 people were given the medication while in 2011, that number grew by 10,000 to a staggering 47,000. And it young adults who are most at risk. The rate of those who abuse Xanax nearly doubles with young adults. The rate of abuse amongst those ages 18 to 25 is 10.3% while the rate for those 26 and older currently around 5.7%. What happens when s/he’s on Xanax. The goal is to get your friend to accept treatment. Once out of treatment, relapse will remain a possibility. A high percentage of people relapse due to being in the wrong environment. To cope with anxiety and relieve it without medication, your friend may need you to help with accountability. Do fitness together. Plan events or activities that promote inner calm. But understand that this is NOT your fight. Your support can make a great difference. However, it’s up to your friend to do the work. Have any further questions about Xanax? 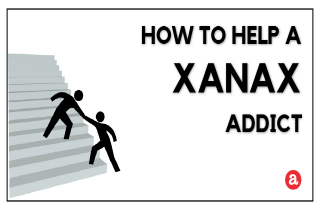 If you want to know how else to help a Xanax addict, we invite you to ask your questions in the comments below. If you have any advice to give for people currently trying to help a Xanax addict, we’d also love to hear from you. We try to provide a personal response to each comment. If you’re in immediate need of help, please give us a call. Operators are standing by 24-7. Calls are always confidential. We understand addiction. We’ll talk you through the treatment process.